Delia Russell, 17, of Cheshire Township was a senior at River Valley High school, played basketball with her girlfriend Tiffany Hoffman, 18, and Tiffany’s brother Gabe Hoffman, 13, both of whom lived on Roush Lane in Cheshire, at the local basketball courts in the village. River Valley High School used to be located in Cheshire and was moved to Bidwell, Ohio several years ago. The building still stands and the property is now owned by AEP. 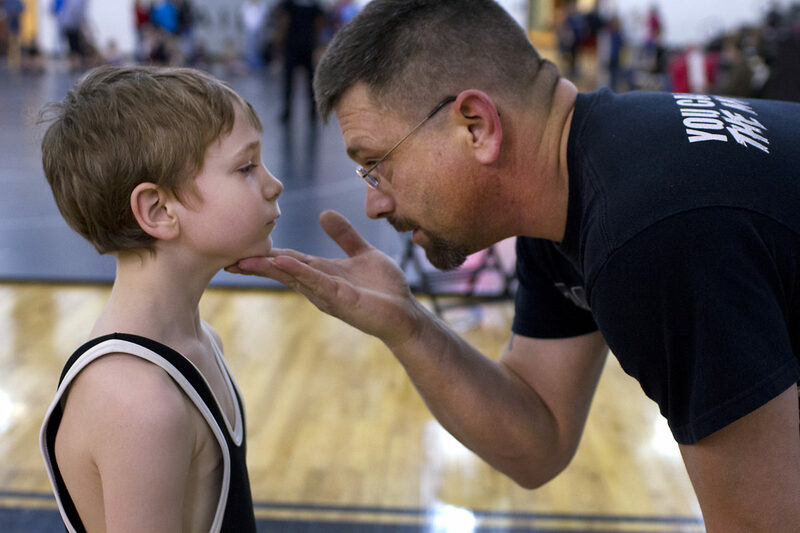 Romie Mays coaches his son Jacob before a match at River Valley High School during a River Valley Youth Wrestling benefit. The benefit was to raise money for Andrea Bailes, a student from Point Pleasant, West Virginia, who died in a car accident last November. The meet matched four different teams of youth, sixth grade and younger, from Point Pleasant, Jackson, Alexander and River Valley. Romie’s wife, Jen, was a clerk at the Cheshire Food Mart on Highway 7 in Cheshire. The family lived in Cheshire. The high school was relocated several years ago outside of Cheshire into Bidwell, Ohio to accommodate students in a newer facility. Pictures are shown of Penny Roush, once a resident of Cheshire who grew up in the village now residing in Rio Grande. Penny began attending Cheshire Baptist Church at twelve days old and claims to be one of the longer attending members. She was baptized November 27, 1966 and still attends the church today. Cheshire Baptist church is the last church left in the village. Upper left, Penny is 15 years old. Lower left, Penny is dressed up for the prom. Center photograph is of the house she grew up in along the river on Riverside Drive, no longer there anymore. Penny recalls fond memories of taking pictures on special occasions next to the river. 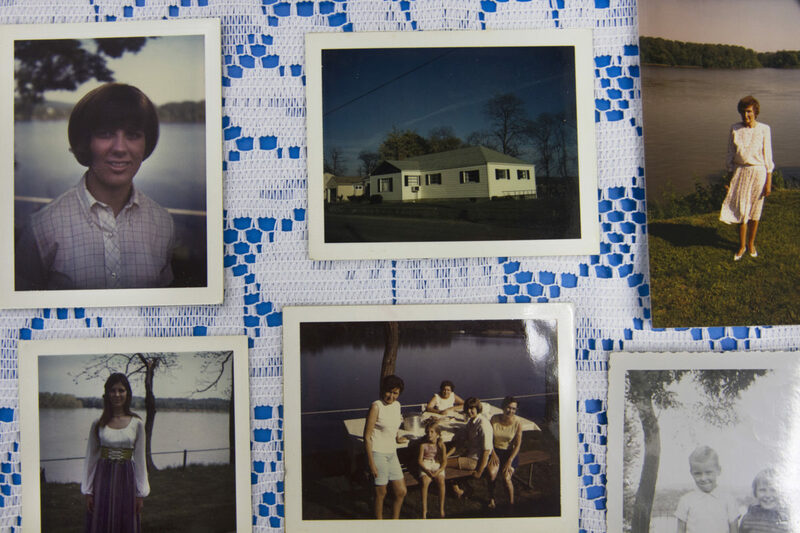 Pennys mother is pictured on the top right and another photograph of her and her brother by the river is pictured in the lower right corner. Jack Freeman of Meigs County along with his brother Bob, who lives within the Cheshire Township and Pete Roush, of Addison Township spend time together in the morning at the Cheshire Food Mart and Marathon gas station on Highway 7 in Cheshire in the morning. The market is centrally located on a road that runs through the village of Cheshire and is a channel to the nearby Gavin Power Plant, Kyger Creek Plant and the village of Gallipolis. 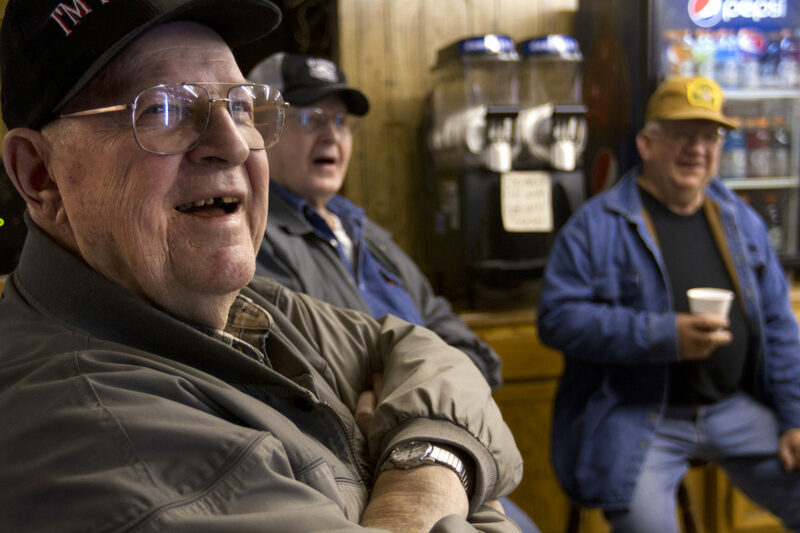 Its a common sight to see a gathering of older men at the gas station store every morning and evening, where community members come to share the local news and catch up on the town gossip. In addition to the convenience store, the mart also sells sandwiches and breakfast food, a draw for community members who sit at a makeshift bar across from the checkout counter. Howard Gruber, a resident of the Cheshire Township since 1982, says, Its like Mayberry here. Everybody knows everybody and well take care of you. He also says that despite the health implications raised by other community members, many people, the majority of whom are older, still reside in Cheshire and are physically fine. In fact, he says, some of those who have moved away wish they hadn't. A young calf walks into the barn for the evening as Chris Palmer’s dog, Reinhart, checks out the scene on land owned by David and Connie Palmer in Cheshire. The Palmers along with their son, Chris, have lived in Cheshire for at least 25 years, raising young dairy calves for larger farms for the last four years through the Kentucky Hefer Growers organization. The Palmers are Phase 1 growers, raising calfs from 0-4 months for about two months at a time. They have about 102 calves on their farm. Their son Chris, 22, graduated from River Valley High School in 2007 and hopes to raise dairy cows himself. David does not mind the proximity of Gavin Power Plant. “It might affect us some day, health-wise, I don’t know, that’s what you hear…but actually, West Virginia might get worse than we do,” said David. 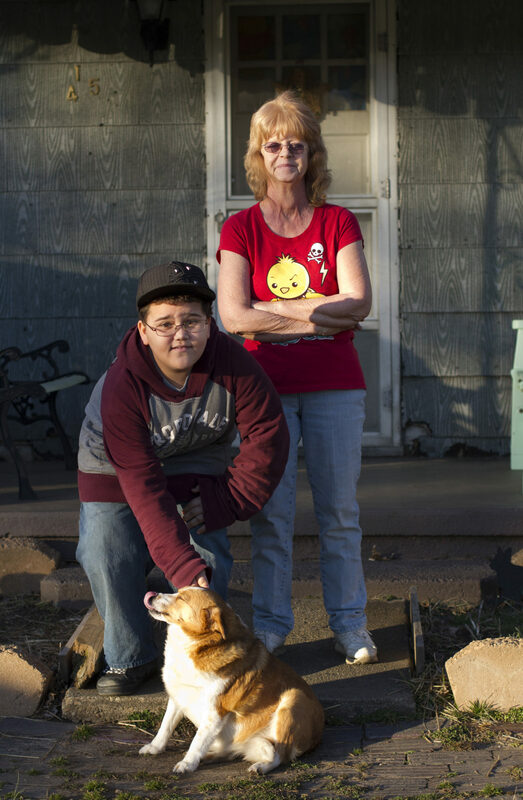 Francis Horne, her son Joey, and their dog Sally Girl pose for a portrait outside their home on Mulberry Avenue, a home that stands alone between three other blocks in Cheshire behind the Baptist church. Former homes where residents once lived were razed as they left and grass has regrown over these properties. Horne rents the home and has lived there for the last two years now. This is home to me, Francis said. 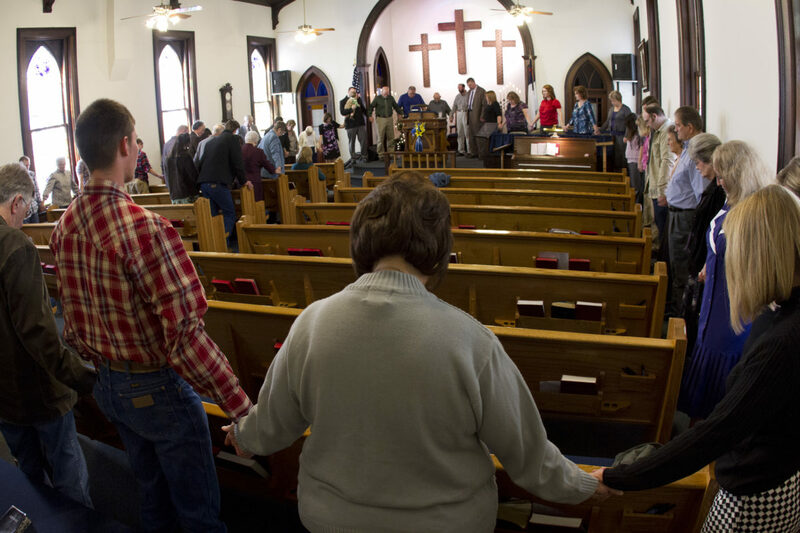 Church members hold hands together at Cheshire Baptist Church during the military prayer on Sunday morning. The tradition began about five years ago and is an important part of the service. Members pray for those fighting in wars abroad and those recovering at home. Pastor Jon Mollohan, 27, began ministering at the church in 2012. 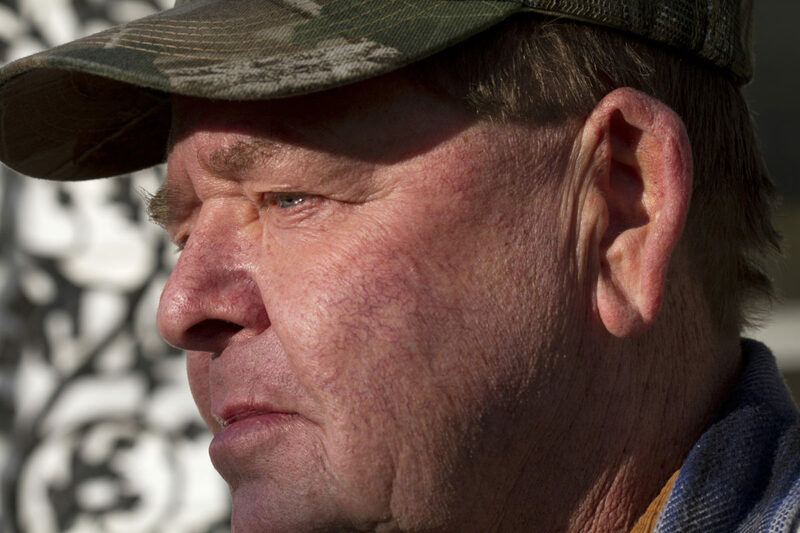 He grew up five miles from the church and moved to Bidwell for several years. Jon is familiar with the buyout and hopes the church will continue to move forward. “We all don’t want to be forgotten. We want to be loved,” he said. This is the last church in the village of Cheshire and still draws former residents who moved away after the buyout. The church was dedicated in 1889. 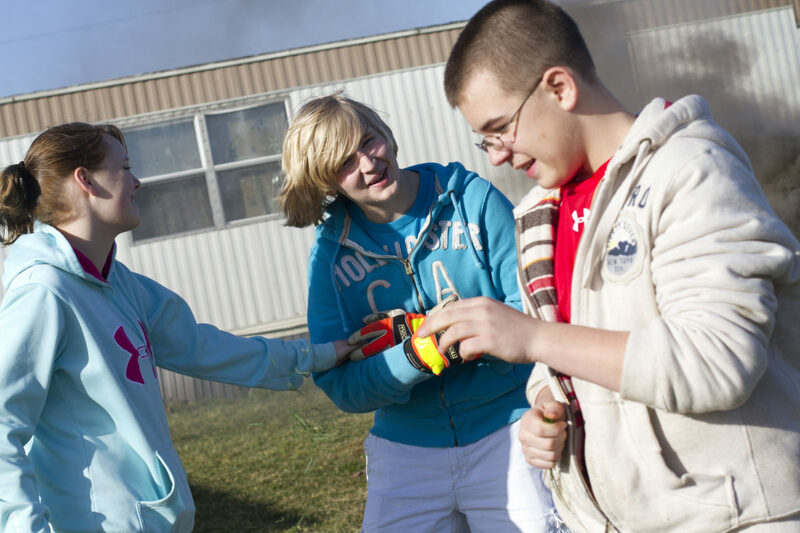 Brothers Chris Hoffman, 16, and Gabe Hoffman, 13, of Cheshire play together with Desiree Slezak, 15, of Bidwell outside the Hoffman’s trailer on Roush Lane. The three along with friend Tony Felix also of Cheshire spent time outside on a sunny day burning trash and throwing around a football. “There’s not much to do around here…there’s a bunch of old people,” Felix said. 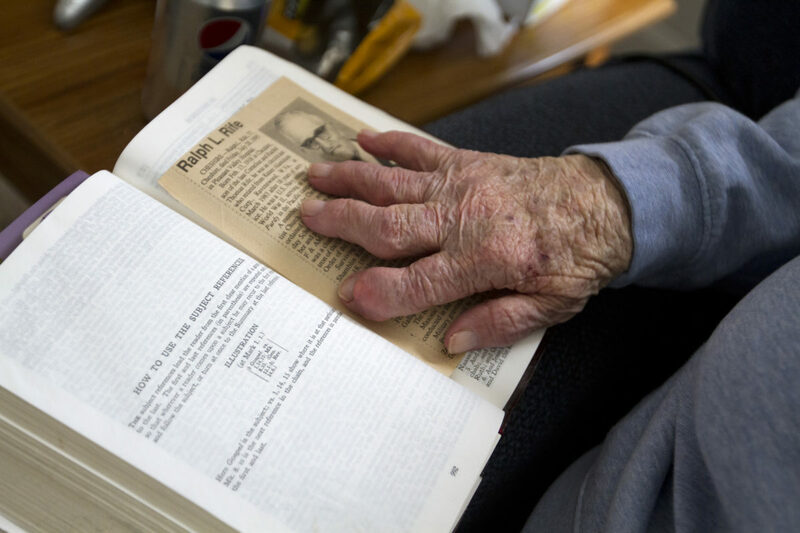 Gladys Rife, 90, holds her hand over her husband’s obituary found in her Bible. Ever since she was married to her husband Ralph, Rife lived in her home on Highway 7 in Cheshire since she was 17 years old. Gladys endured open heart surgery and the passing of her husband at the age of 77 of lung cancer. Her son, who was born in her house and eventually became mayor of the village, lived steps away from her home as did her grandson. Originally from Huntington, West Virginia, her father worked on the river on Eight Mile Island and eventually bought a brick home in Cheshire. Unhappy at first about the move to Cheshire, Gladys eventually had a change of heart. “If we didn’t move here I would’ve have met my husband,” she said. Steve Scott, 63, remembers memories of Cheshire. Scott lives with his brother, John, next to Triple B’s Pizza off of Highway 554 in Cheshire. Triple B’s once was Scott’s Grocery, a local gathering place that opened in 1950 by his father, Bill Scott. Don Casey and his wife Michelle of Rutland, Ohio butcher chickens in their backyard for the first time on Sunday. Casey and Michelle owned the Cheshire Food Mart on Highway 7. Don, originally from Cleveland, moved to Rutland to be with his wife, eventually buying a farm and a hundred head of cattle. He began raising chickens and sold the eggs at the market. Because he raised the chickens from a young age, Don says he didn't have the heart to look them in the eye and slaughter them, so he employed the help of several Cheshire residents, Howard Gruber, Connie Mulford, and Jim Arrowood. Together, they slaughtered, plucked and butchered ten chickens. In the end, Don decided that it was too much work and hed probably have them butchered by someone else to save time. Don had hoped to expand his food mart to accommodate more people and have a place where people could sit and eat. 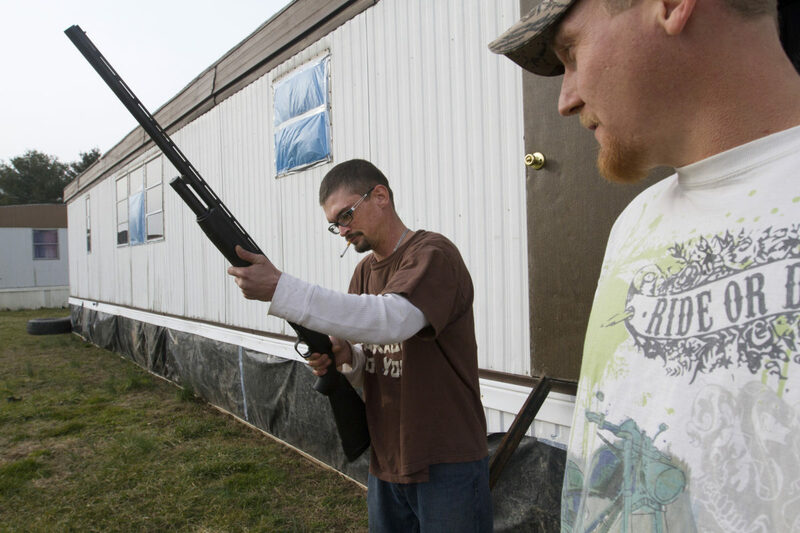 Word around town said renovations at the Kyger Creek Plant would recruit more employees and Don had hoped to increase his business from it. 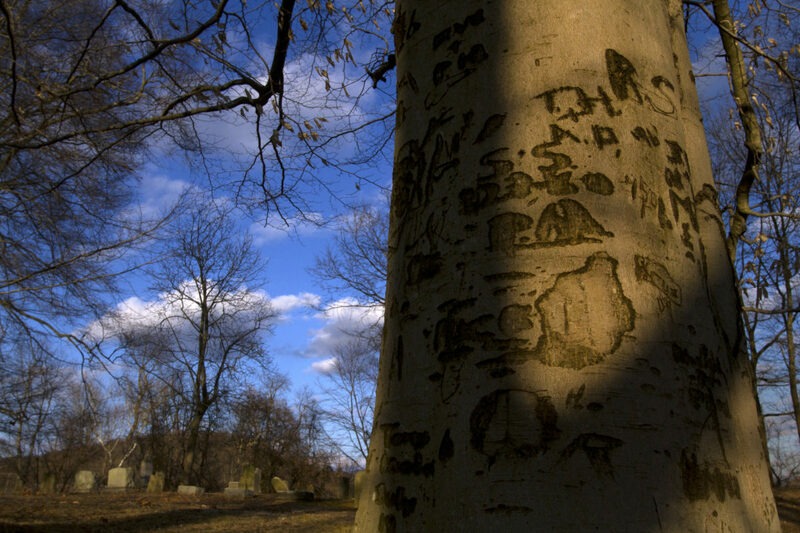 Carved etchings cover a tree at Roush Cemetery in Cheshire. Early settlers of Cheshire Township in 1811 included an Adam Roush and George Roush. 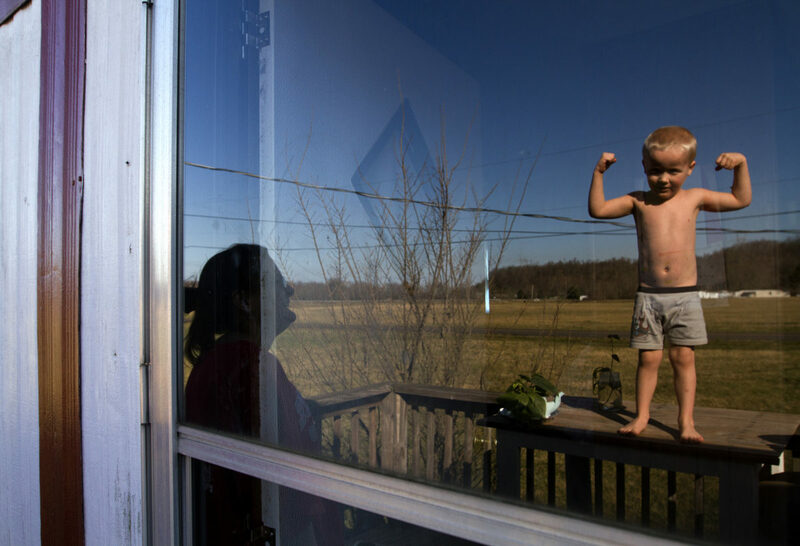 Val Fuller, 4, shows off his muscles as his mom Cyndi, watches over him outside of their trailer on Roush Lane. 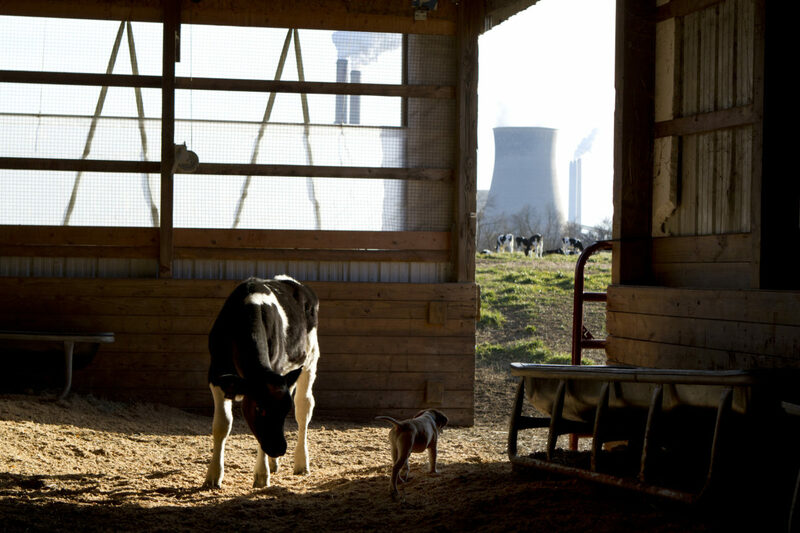 The family moved into Cheshire three months prior and enjoyed the wide open space behind their trailer, which was farmland owned by Connie and David Palmer that provided a clear view of Gavin Power Plant. 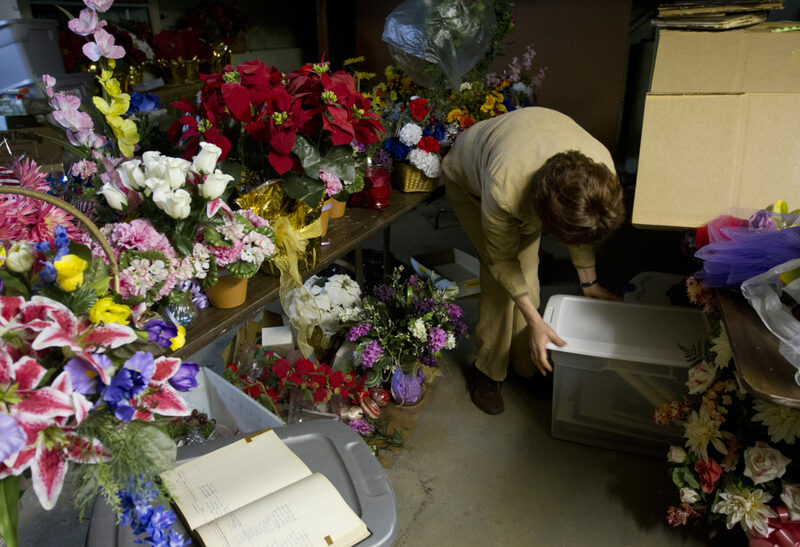 In the basement at Cheshire Baptist Church, artificial flowers and old records are stored away. 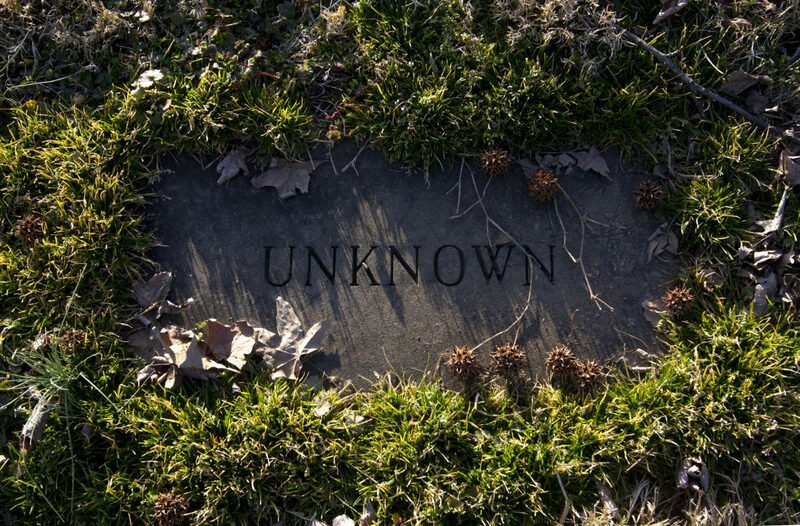 An unknown grave marker is seen in Cheshire. 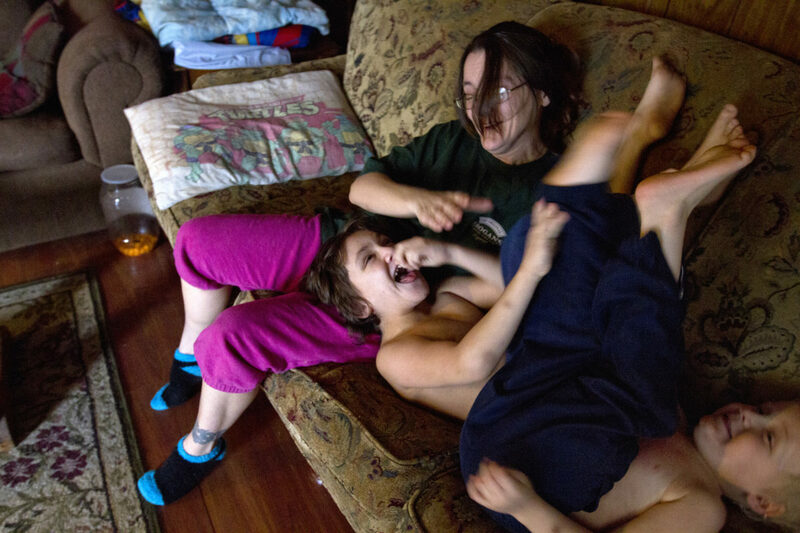 Cheshire, Ohio is a village where many residents consider their home sacred. As a young girl, Gladys Rife, 90, remembers secretly swimming off the banks of Cheshire, across the Ohio River to the other side just to pluck a watermelon off of its vine and swim back with her friends to gorge on the bounty of summer. Grocery stores, filling stations, a train depot, riverboats, farms reaping produce or livestock, a flour mill, a barrel factory and a saloon once graced the streets of Cheshire. The discovery of coal and the subsequent boom in electricity created more jobs, attracting workers and their families to an idyllic place to live near the river. The arrival of the Kyger Creek Power Plant in 1955 and the James M. Gavin Power Plant in 1975 secured the small village as a place that represented growth and industry. Almost 20 years ago the boom came to a halt. High levels of sulfuric acid emissions released from the nearby Gavin Power Plant caused health problems amongst residents of Cheshire. 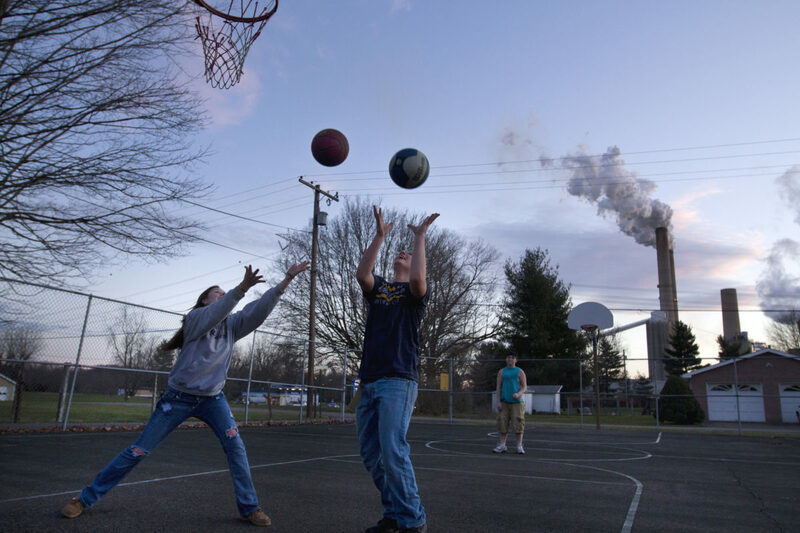 A new pollution control device trying to limit the amount of nitrogen oxide emissions released into the air inadvertently created another harmful byproduct, sulfuric acid aerosol. People complained of sore throats, sore eyes and difficulty breathing. In 2001, villagers came forward with a citizen suit pressuring the power plant to lower their emission levels or seek property and health damages. American Electric Power countered with an offer to residents in the village of $20 million to relinquish their properties and move. Most residents of Cheshire left with the monetary compensation. Despite reasons to leave, a handful of villagers stayed, even if it meant signing away their rights in an agreement not to sue the plant over future health complications. After the buyout, twelve villagers remained. Once portions surrounding the original village were annexed, the village increased to its present population of less than two hundred people. The heart of Cheshire still remains today. There are fewer houses, fewer farms and the nearest grocery store is about fifteen minutes away. But step into the homes and meet those that still live there – and you will find what was there almost two hundred years ago: a place that villagers call home.